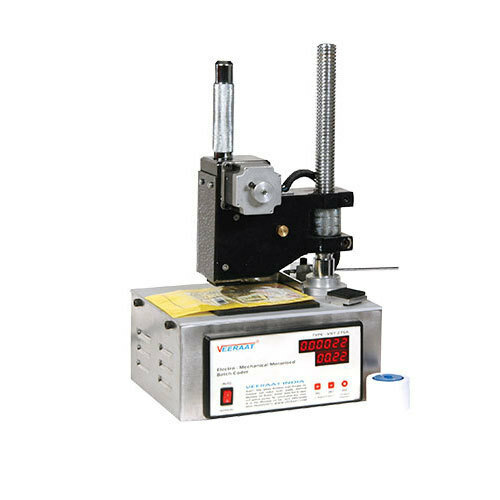 We are offering Table Top Batch Coding Machine to our clients. Very compact and lightweight portable tabletop model. Printing Medium Quick-drying ink (Black,Violet,Red,Green,White,etc. A low-cost machine with very low operating and inventory costs. Uses standard Grooved or flat stereos and fast drying coding ink. Inbuilt timer for automatic timer operations or can be connected to a proximity Or foot switch for controlled operation. Specially designed table-top stand automatic /semi-automatic operation to Print on tins, boxes, labels, pouches, bag, bottles, etc. For the online system, the print head is mounted on the machine and Coding is done whenever the present machine stops for sealing. It is Mechanically synchronized with the machine to give registered coding at the Exact location. For the tabletop system, the coder is mounted on a stand and the item to Be printed is placed manually. Either a foot switch or a timer activates the Coder semi-automatically. Established in the year 1985, we, “HNC Onics” are among the distinguished organization engaged in manufacturing and supplying of Industrial Clutch Brake, Batch Coding Machine And Controller, Batch Coding Machine Accessories, FFS Machine Controller, Weigh Filler Machine Controller, etc. Manufactured in accordance with the industry laid norms, these products are acknowledged for their longer functional life, least maintenance, exceptional performance and rigid construction. All these products are supervised at the manufacturing stages, in order to maintain high standards of quality and remove flaws, if any. Also, these products are rigorously tested on different parameters of quality and then forwarded for the final dispatch.